Using our digital template, we are able to process a kitchen template to install in 7 business days. 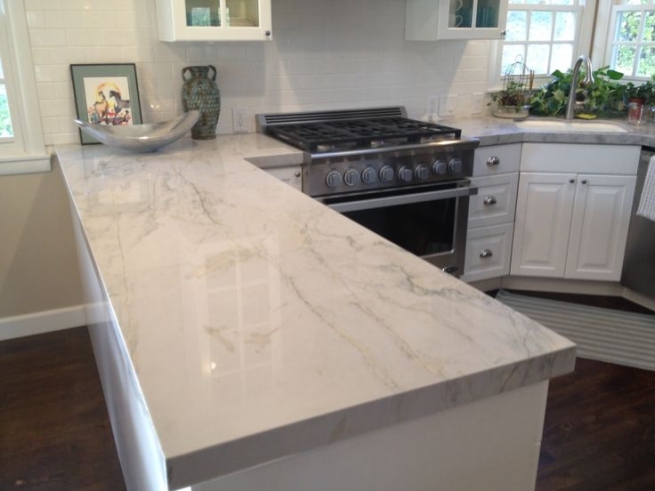 How long will I be without countertops during a remodel? The great thing about our digital templating means, you may keep your existing countertops until the day of installation. Typically we are able to do a tear-out and install for an average kitchen in 1 day, however if a job is larger than 150 square feet, or requires an additional template the process may require 2 days. What do I need at the time of template? We need your sink for undermounts, as every sink varies from templates provided with the sink or online, we require the actual sink, so we can assure the correct cut. In addition, we recommend having model numbers or specs for your appliances, so we can assure the correct sizing of parts prior to install. What do I need at the time of install? At the time of install we recommend having all appliances on site, so we are able to re-confirm sizing and make any additional on-site cuts as necessary. We also need faucets, insta-hot water, garbage disposals or soap dispensers on-site with location confirmation so we make sure that our cuts are in the right location and of the right size.